Aerin has launched a new trio of rose colognes for women: Bamboo Rose, Linen Rose and Garden Rose. Bamboo Rose ~ "Bamboo Rose Eau de Cologne is a green floral rose blend that brings to mind the formal beauty and artful simplicity of an Asian garden. Fragrance story: This scent draws you irresistibly on as you follow the trail of roses deeper and deeper into the garden. A refreshing top note of Sicilian bergamot and mandarin blossom fuse effortlessly with dewy green leaves for an impression of delicate, elusive femininity. A profusion of white Bulgarian rose, Bulgarian rose absolute, rose infusion and rose centifolia is enhanced by the cool allure of jasmine petals. The final shimmering touch is a hint of pink pepper, amber and musk." Linen Rose ~ "Linen Rose Eau de Cologne is a floral amber rose that evokes the joy of a relaxed, casual day at the beach, with cool white linen sundresses and sun-kissed roses. Fragrance story: Its modern, effortless and free-spirited scent captures the pure simplicity of a rose touched by the salty-cool ocean breezes, open to the sea, sand and sky. The energizing rush of sun-drenched top notes scatter orange flower petals among lemon leaves to create a visible burst of freshness. They flow through the enveloping warmth of the rose-filled heart of the fragrance—white Bulgarian rose, exotic ylang-ylang, refreshing coconut water, Bulgarian rose absolute, Bulgarian rose oil and rose bouton. Like the sun upon the sand and sea, a golden glow emerges in the final notes of vanilla and amber. Sun-bleached vetiver adds the final modern note of depth and refinement." Garden Rose ~ "Garden Rose Eau de Cologne takes you into the English countryside, filled with the irresistible sent of wild roses. Fragrance story: Lively, lush and free-spirited, this fresh floral rose scent opens with the natural green notes of geranium wrapped about the fresh floralcy of rose bouton sauvage. Like a bud opening, the heart of the fragrance unfolds to reveal the uninhibited splendor and depth of white Bulgarian rose, the rich, full-bodied rose bulgare and lush rose centifolia. Together, they capture the irresistible spirit of the English garden rose, blooming boldly in the sun, enhanced with the smooth warmth of sandalwood and amber and softened by musk." Aerin Bamboo Rose, Linen Rose and Garden Rose are available now at Nordstrom, $165 each for 200 ml. Booooring. But then, I think I’m 180° from Aerin’s target audience. I imagine I will sniff them just in case, but my hopes aren’t high. I will certainly sniff them if I see them, but ditto. 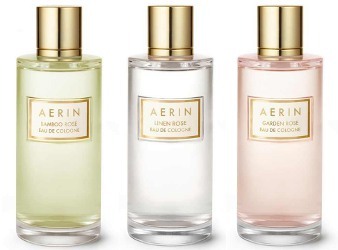 I know they’re a little dull compared to some of the niche houses (or even Estee Lauder), but I do really like some of the Aerin scents as comfort perfume. I also have a soft spot for Lilac Path because it’s one of about 3 things I could wear while pregnant without getting sick. I’ll probably give these a sniff – Garden Rose sounds nice and springy to me. And you are absolutely allowed to love whatever you want, and you don’t have to apologize! One or more people commenting to “blow off steam” about launches they find dull should not be interpreted as an insistence on conformity. What Robin said. I’m not getting my hopes up because usually the Lauder roses are mostly geranium to me or have a headachy sandalwood base, and what I want is a pink potpourri rose on the light side (not perfumista bait by a long shot) that doesn’t give me a headache. I think Lilac Path is very pretty. Very safe sounding- pretty but safe. IF you wanna drop some serious change on scent sure not to offend, then these would seem to qualify. I must say though, Linen Rose sounds really intriguing for summer! More boring cylindrical high-priced bottles for so-called exclusivity! I am like catlady4………I am a fan of Aerin Lauder fragrances. IMO Evening Rose is sensational and Ikat Jasmine is my favorite from the line. I like fragrances that have that “clean” smell to it and AL fragrances do that for me. I tend to like fragrances that most people don’t, and that’s okay with me because I always have liked being different. But, again, I’m a fan. Because I like a clean scent, I will probably like the Linen Rose. Definitely, I will want to sniff each of these. I have a feeling that the longevity is probably “meh”. We shall see. Thanks for posting these. I’ve never tried an Aerin scent, no, wait, I have a manufacturer sample of one. It think it’s Lilac Path. Anyway, this is a good reminder that I want to expand my horizons at the perfume counter and try more scents outside my usual experience. I love rose but have had a hard time recently with rose perfumes causing headache, so perhaps these lighter fragrances will be worth a sniff.